As fibre-optic networks become more prevalent in South African businesses and homes, Cape Town could be boasting one of the fastest connections in the world. A German telecommunications company called ADVA Optical Networking, this week, tested the capabilities of the service which resulted in 400 Gbps. Cape Town Business News alleges that these speeds have only been reached four times in the world on fibre-optic networks and that these speeds have never been measured at this speed in Africa. Xanthea Limberg is the City's Mayoral Committee Member for Corporate Services and Compliance. She praised the network speed test by saying, "‘The trial demonstrates a potential quantum leap in both the speed and the potential performance of our network. At 400 Gbps, it takes less than 0,02 seconds to transfer data equivalent to the capacity of a movie." The stats will interest citizens who might have been overly sceptical of broadband growth in South Africa. President of South Africa, Jacob Zuma, only mentioned broadband once in his State of the Nation address which took place on the 11th of February, 2016. President Zuma said, "Government will fast-track the implementation of the first phase of broadband roll-out to connect more than five thousand government facilities in eight district municipalities over a three-year period." According to the City of Cape Town's website, R1,3 billion is spent on establishing a broadband network across the city. Limberg continued by saying that they successfully connect 300 government and public buildings, including a host of municipal buildings on the fibre network. The project was engineered through a 106km route that stretches between Nyanga and Mitchells Plain. South African cities are reaping the benefit of constantly improving Wi-Fi access points as well. An infographic released by the Tshwane Municipality showed that they had 630,000 unique users as of May 2015. Their aim is to ensure that by 2017 there will be Wi-Fi in walking distance of every citizen in Tshwane. 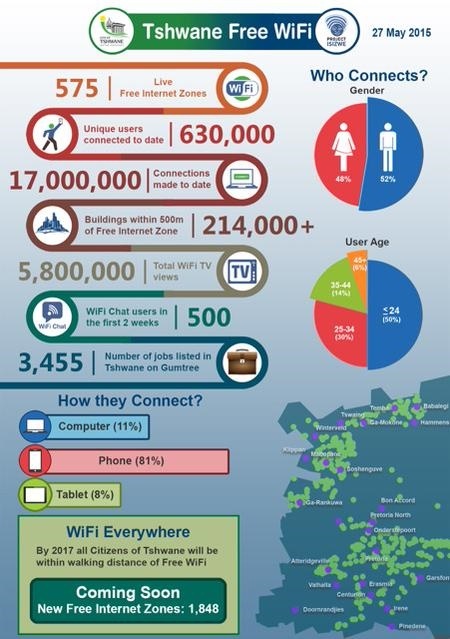 Cape Town have 190 of their own Wi-Fi points that are being utilized as well.